Creators’ Statement: When a visual artist and a poet decide to create a book together, who decides what constitutes a book? In conventional works, text trumps image. In art books, it’s the reverse. We, however, wanted to work in a more democratic way to make an art object that couples image and text so tightly that it would be hard to tell which existed first. To this end, the poetic form was chosen to complement the image on one side; on the other, the poem came first. The repetitions in the insistence of green, a villanelle, suggest the sounds of leaves in the wind. The long line of the horizon, separating earth from sky in blue transport, cuts the world in two, mimicked by the reversal technique that literally turns our world upside down. This latter poem, a kind of visual mirror, employs a form popularized by British poet, Julia Copus. Materials: The photographs and text have been printed using pigment-based inks on acid-free paper. 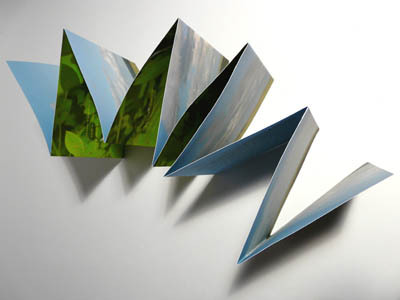 We chose the Oriental fold book structure because it afforded us both close-up and panoramic views.